Godolphin’s All-Star Mile hopefuls Best Of Days and Hartnell are set to trial on the course proper at Randwick on Thursday. Hartnell, above, is among the nominations for the 2019 All-Star Mile at Flemington. Photo by Ultimate Racing Photos. Trainer James Cummings is looking forward to seeing his Group 1 winners carry the famous Godolphin royal blue colours into the 2019 Autumn Carnival and is expecting both stable stars to take great benefit from their 900m trials. “We have got Best Of Days in a course proper trial on Thursday,” Cummings told Sky Sports Radio Racing HQ. One hundred and twenty-eight horses have been nominated for the inaugural running of the $5m All-Star Mile (1600m) at Flemington on March 16 and in early betting at Ladbrokes.com.au Hartnell is marked at $21 and Best Of Days is a $26 chance. The Cummings trained stablemate Alizee has been installed as the $6 favourite and is also well into the 2019 Autumn Carnival preparation after finishing third in a 900m Rosehill barrier trial on January 15. English import Best Of Days was sent straight for a spell after winning the Group 1 $1m Kennedy Mile (1600m) at Flemington on the first day of the four day 2018 Melbourne Cup Carnival while Hartnell was also sent to the paddock after finishing tenth. 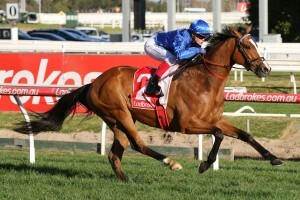 Hartnell has been the flagbearer for the Godolphin Team for several years and the eight year old war horse didn’t disappoint last Spring when he added a fourth Group 1 win to his record with a hard fought victory in the Group 1 $1m Epsom Handicap (1600m) at Randwick. Hartnell claimed his first Group 1 trophy during the 2015 Sydney Autumn Carnival with a win in the Group 1 $1.5m The BMW (2400m) at Rosehill and then had to wait until the 2016 Spring Carnival to collect his second Group 1 win in the $500,000 Turnbull Stakes (2000m) at Flemington. Hartnell continued to race at the highest level then showed his versatility with a first up win in the Group 1 Ladbrokes C.F. Orr Stakes (1400m) at Caulfield in the 2018 Autumn Carnival. Early betting for the 2019 All-Star Mile at Ladbrokes.com.au: $6 Alizee, $8 The Autumn Sun, $11 Grunt, $13 Happy Clapper, Land Of Plenty, $15 Extra Brut, Ringerdingding, Te Akau Shark, $16 Shoals, $18 Night’s Watch, $21 Amphitrite, D’Argento, Hartnell, Le Romain, Mystic Journey, $26 Best Of Days, Brutal, Melody Belle, Shillelagh, Unforgotten, $31 or better the rest.